Throughout history, many families have honored their family members by constructing impressive buildings made of stone. Years ago these above ground entombment structures were usually expensive and reserved only for the wealthy. 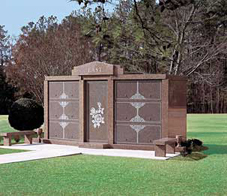 Today, through advanced engineering technology and modern manufacturing, the Personal Mausoleum is now an affordable burial option for most everyone. 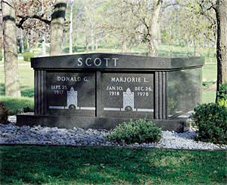 Wisconsin Monument & Vault Co. features Personal Family Mausoleums that are individual structures and are built entirely of Granite and come in a wide variety of colors. These buildings are carefully engineered, precision cut, and joined together to create a permanent structure that will withstand the elements for centuries to come. Virtually immune to staining, abrasion, or other damage, the solid stone roof and walls are maintenance free. Non-corrosive stainless steel dowels and anchors secure each structure and eliminate dependence on adhesives. Advanced design keeps the interiors clean, dry and fresh. 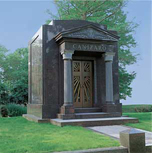 This style of Personal Mausoleum comes pre-built in 1,2,4 and 6 entombment crypt configurations. All are designed to fit in a minimum of space, have the same permanence of design and construction as the larger walk-in units, and are economical in price.